When you step off the train from the airport and into Central Tokyo, you’ll feel like you’ve walked into the strange and wonderful world of the best video game you could possibly imagine – one from the early days of the internet, when designers weren’t afraid to sacrifice realism for magic. The best way to conceptualise Tokyo is to imagine rounding up a group of the most imaginative architects and scientists the 1980s had to offer and asking them to come up with a model of what the perfect city might look like in 2020. As the original megacity, Tokyo is obviously huge, with its enormous population of around 38 million people (nearly twice that of New York) resulting in an explosion of skyscrapers in recent years. However, somehow ‘skyscraper’ – a word usually associated with anonymously corporate steel structures – does not seem quite right when it comes to describing the neon constructions that line Tokyo’s bustling streets. Like a real-life game of Tetris, these teetering towers look like glowing neon blocks stacked angularly skyward. Buildings in Tokyo are miracles of engineering and monuments to advertising, with vibrantly colourful signs lining every scrap of surface. Amid all the noise and fun, it is easy to forget that Tokyo is Japan’s commercial hub, with business booming and the economy gaining pace as the country continues its recovery from the global financial crisis. Tokyo is now well equipped for international business travel, having hosted 249 international conferences in 2015 alone, making it the sixth most popular conference destination in the world at the time. 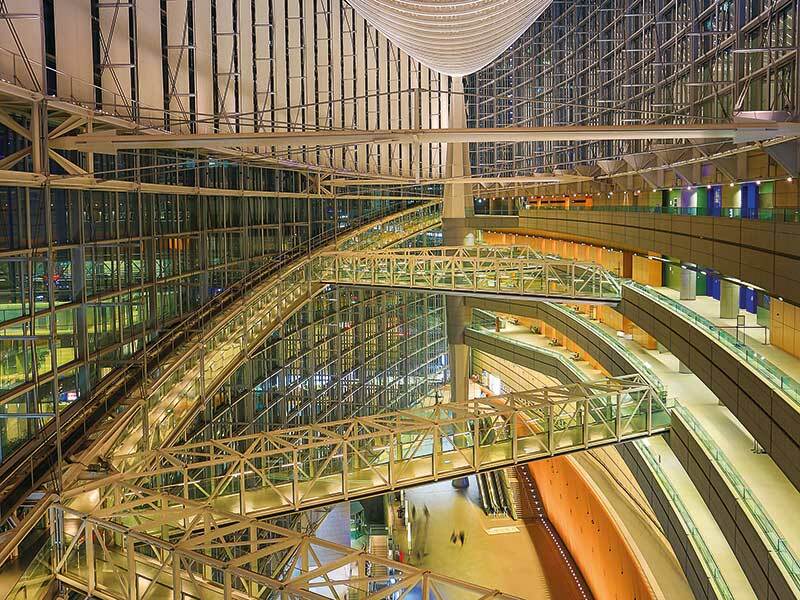 One venue that makes for a particularly special conference is the Tokyo International Forum (TIF). Designed by Uruguayan architect Rafael Viñoly, the man behind several Park Avenue skyscrapers and London’s famous Sky Garden, this glittering construction is something to behold. A graceful structure made of glass and wood, TIF’s elongated, boat-like frame is fiercely modern. At odds with the kaleidoscope of colour that is downtown Tokyo and yet in keeping with the Japanese ethos of blending modern and traditional design, this venue makes for a truly memorable conference setting. While the main hall alone seats up to 5,000 people, TIF also boasts a further seven halls plus many restaurants and shops, making it a great choice for large gatherings. Situated on the site of the old Tokyo City Hall, TIF is located right at the heart of the city and is easily accessible from either of Tokyo’s two international airports. Being a business capital and one of the largest cities on Earth, it would be difficult to find a city that offers business travellers more choice; the city boasts almost 98,000 hotel rooms suitable for any budget. Outside of conference hours, the incredible variety of choice is undoubtedly one of Tokyo’s finest features. On a weekend, you could sample the freshest sushi in the world at the tiny (but hugely popular) restaurants that flank Tsukiji Fish Market, where Tokyo’s finest chefs queue at sunrise for a place in the famed tuna auctions. In the evenings, after the conference activities have come to a close, make like a local and head for an izakaya. These traditional wooden buildings hide in plain sight among the screaming neon of the city’s many ramen bars. Best described as a sort of tavern, you are served a tapas-style selection of Japanese specialties like hiyayakko and edamame beans, and plenty of Japanese beer. Here, mingling is heavily encouraged. Whatever it is you find yourself doing, you’ll be left wondering where else on Earth could possibly offer so much in such a small space. Tokyo is so vibrant, other cities pale by comparison.